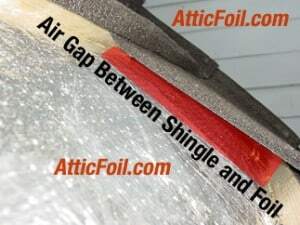 Home › Can I use AtticFoil™ Directly Under My Shingles? Can I use AtticFoil™ Directly Under My Shingles? Can I Install Radiant Barrier Under the Shingles When I Have a New Roof Installed? It won’t work; in fact, it will actually work against you! Do not do this, and please run away from any roofer who tells you otherwise! It gets a little tricky, but we will attempt to explain it in simple terms. Radiant heat by definition is heat transfer from one object (the hot object) to another object (the cooler object) by NON-CONTACT. We really wish you could put foil between shingles and roofing felt or roof deck because we would sell a ton more foil. However, physics is physics – and it just won’t work. If you take radiant barrier foil and sandwich it between the shingles and roof felt, you have now created one solid assembly. Aluminum is a unique element, it is both reflective and very conductive. This is one example why we cook with aluminum cookware; it conducts heat very well, which is good for cooking, but not so good for living spaces. Here is an illustration most people can relate to: Have you ever picked up a hot potato that was wrapped with foil? It feels super hot, right? Why is that? Well, when your skin touches the foil it creates direct path (there is no longer an air gap, just the foil touching your skin) so the heat flows directly into your hand, making your hand very hot. The idea is that heat doesn’t care what objects it’s traveling through to carry heat flow, as long as objects are touching and there is no air space, the heat might as well be traveling through one, large object. When an air gap is present, the heat is then forced to convert to its radiant form so it can jump the gap and continue traveling via conduction. This is a clear sign the roofer does not understand the concept of radiant heat. Does the roofer have a good lawyer? We know of several cases where the roofer installed a radiant barrier in this manner, essentially not installing a radiant barrier since radiant heat is not present if there is no air gap. We often see products (sometimes even AtticFoil™) incorrectly installed in this way to try to create a radiant barrier. The roofers had no defense since the laws of physics, combined with the definition of radiant heat/radiant barriers apply to roofs too. In most of these cases the roofer/roofing company ended up settling the case since the lawyers said they had no defense since a radiant barrier isn’t a radiant barrier without radiant heat, and you can’t have radiant heat unless there is an airspace for radiant energy to travel across. Read the complete information on Installing Radiant Barrier Under A Tile or Metal Roof. If you are going to install a roof like this, what a great time to go for it; you will have the necessary air gap to make it work and the results are awesome. You can install the radiant barrier foil below the raised shingles either on top or below the battens. The easiest and best way is to run the foil out over the roofing felt, tack it down and then install the battens followed by shingles or metal roofing.